New Delhi is known for historic sites, parks, shopping, museums, and fun & games. Your plan includes some of its best attractions: admire the natural beauty at Humayun's Tomb, contemplate in the serene atmosphere at Lotus Temple, contemplate the long history of Gurudwara Bangla Sahib, and explore the historical opulence of Red Fort (Lal Quila). For maps, traveler tips, ratings, and tourist information, read our New Delhi road trip planning tool . Singapore, Singapore to New Delhi is an approximately 9-hour flight. You can also drive. Traveling from Singapore to New Delhi, you'll gain 2 hours due to the time zone difference. When traveling from Singapore in February, plan for slightly colder days and cooler nights in New Delhi: temperatures range from 29°C by day to 13°C at night. Finish your sightseeing early on the 24th (Sun) so you can travel to Bangkok. Bangkok is known for historic sites, shopping, nightlife, spas, and museums. 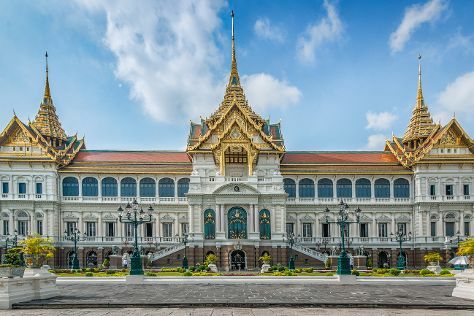 Your plan includes some of its best attractions: explore the historical opulence of The Grand Palace, contemplate in the serene atmosphere at Temple of the Emerald Buddha (Wat Phra Kaew), get a taste of the local shopping with Khao San Road, and hunt for treasures at Chatuchak Weekend Market. Quickly create a custom-made itinerary for Bangkok using our trip planner. You can fly from New Delhi to Bangkok in 7.5 hours. Another option is to drive. The time zone changes from India Standard Time to Indochina Time, which is usually a 1 hour difference. Expect a bit warmer weather when traveling from New Delhi in February: highs in Bangkok hover around 38°C, while lows dip to 28°C. Wrap up your sightseeing by early afternoon on the 1st (Fri) to allow enough time to travel back home.